Last week I told you about taking my sister Rolie to Banff. Since then, she has continued her Western Canada trip. First, she flew to Edmonton (north of Calgary) and from there, she flew eastward. Her next touchdown was Regina, Saskatchewan where she visited with our 85-year-old Aunt Net and a whole bunch of cousins. I joined her in Regina on Friday and just got back to Calgary yesterday. Rolie and I spent a lot of time looking at old photos, drinking tea, reminiscing and playing euchre. You each have a partner who sits across from you. You use a regular deck of cards but only the nines, tens, jacks, queens, kings, and aces, so 24 cards. 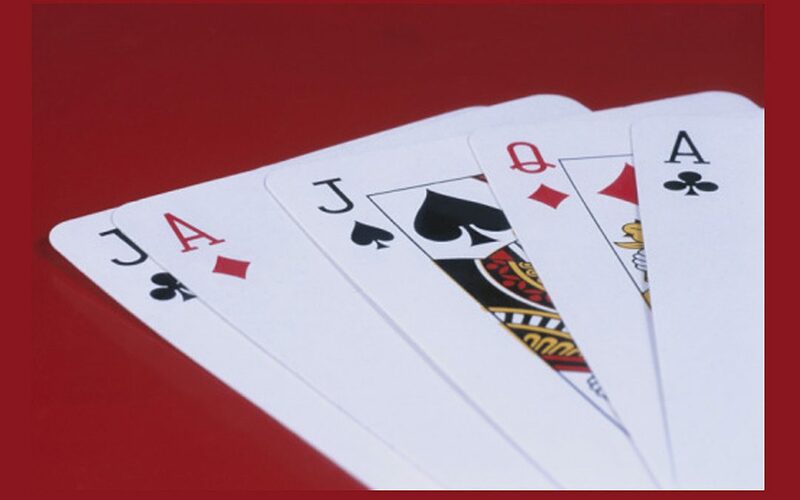 Each player is dealt 5 cards, which means 4 should be left after dealing. Set those 4 on the table, turn up the top one and now we go around the table and decide if it will become “trump”. I won’t get into all the details, but suffice to say that there are different rules depending on where you are playing. According to cousin Ted, the game has been in North America since the 19th century when it was played everywhere. It’s not so popular anymore, but it is still very popular in Ontario. The game has become popular there, at least among my cousins. And a game is usually played every Sunday night at Ted’s house. Each night after supper, we cleared away the dishes and got out the cards. Rolie always partners with Aunt Net when they are in the same city. And they usually always win. I think it’s something about “cross-talk” or the hesitation over picking up a card to make it “trump”. Often partners develop a set of signals. This is just conjecture, of course, because anything like that would be considered cheating. At any rate, win or lose, playing euchre with Aunt Net is always a good time. Have you ever played euchre? Do you have a favourite card game? Do you like clearing away the dishes after supper and dealing a few hands? I’m visiting my Aunt Net and my cousins in Regina, Saskatchewan. 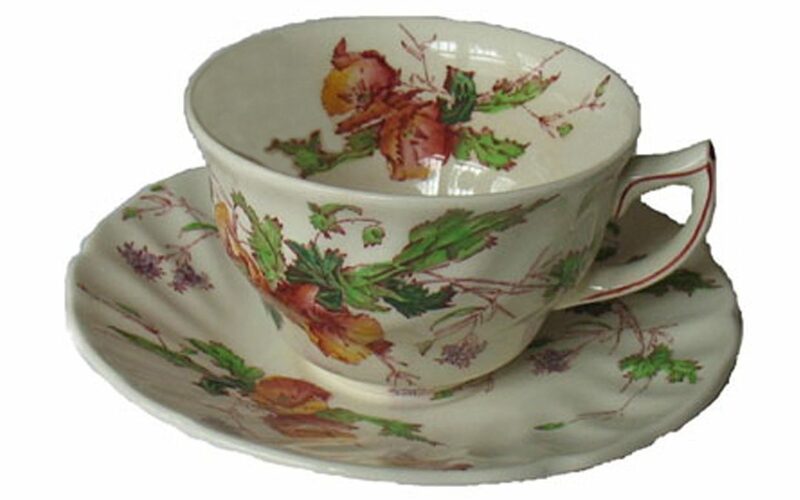 This is Aunt Net’s teacup. Aunt Net is 83 and her friend Joyce is 89. Cousin Ted regularly has “the grannies” over for dinner with his large family on Sunday nights. There are all the usual suspects: brothers and sisters, nieces and nephews, adopted people and various add-ons. We play to 10 points, and we do it three times. Aunt Net and Joyce are partners. I have Chris as a partner for the first round. After we lose, he gives up, goes to help Ted with the dishes and Deb takes over as my partner. Meanwhile, children – old and young – flow in and out of the big house. The dishes and leftover food are dealt with, the table cloth on the dining room table is straightened, and Ted tutors one of the kids in geometry. I carry on with the card game. Granted, I don’t play euchre often, and I’ve had a glass of wine, but, come on, I’m playing against two old ladies. After I lose all three games, Cousin Ted drives me back to Cousin Mary’s house. Cousin Katy is also visiting Regina and she’s staying at Cousin Mary’s house too. Tonight she’s doing quality time with her daughter so she wasn’t at Ted’s dinner. Cousin Mary is hosting the next night’s dinner and she’s made Strawberry Rhubarb Pie, which is cooling on the stove top. She has to go to bed because she’s got a full workday tomorrow. But Katy and I don’t. My sister Rolie (who lives in Saudi Arabia) was supposed to be on this trip but she got sick just before it was time to fly out. So Katy and I are talking to her on the speaker phone. I’m finally getting all the details about Rolie’s illness (which she is recovering from) and next thing I know, Katy has cut into the pie and brought me a piece. We’re busy telling Rolie all about what she’s missing and Rolie definitely wishes she was not missing this pie, and then Mary wakes up. She comes down the stairs, gives us the “frown” and the “That pie is for tomorrow!” Katy and I blame each other for our inability to resist cooling pie. Mary grabs a taste of pie and returns to bed. Like 85% of writers, I am an introvert. And now I’m surrounded by about a hundred relatives and old photo albums and long ago stories and amazing cooking. And my tense mind is loosening up. I have a chapter I’m supposed to be working on, and I decide to just forget about it for now. Now is the time to eat strawberry rhubarb pie, and to eat Aunt Net cookies and date jam, and to simply listen and absorb the world around me. In short, now is the time to fill the Creative Well. When I get back home on Wednesday, I expect my chapter will be waiting for me and I’ll have fresh energy to put into it. How do you fill the Creative Well?